There are movies that become the go-to source for adaptations. 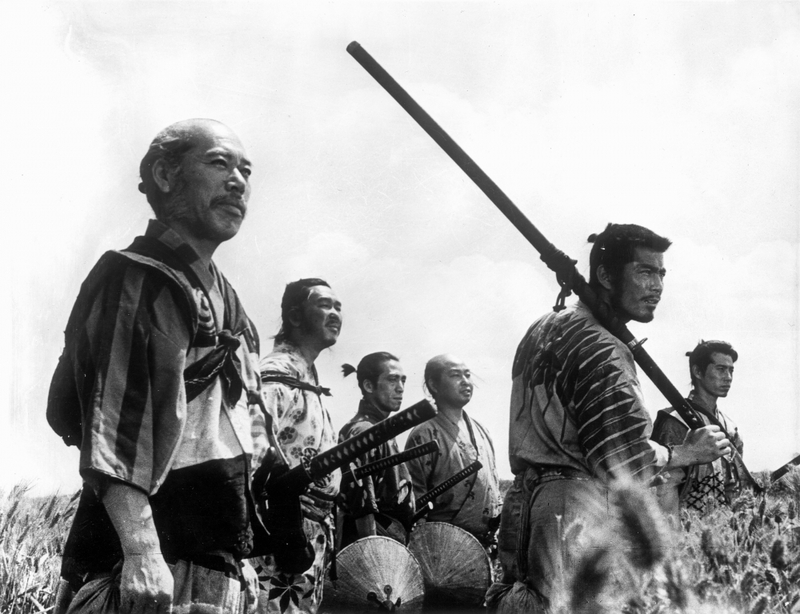 Akira Kurosawa’s Seven Samurai is one such film. In Seven Samurai, a village gets overrun by an army of bandits, intent on abusing the farmers and taking their crops for their own purposes. The farmers send three men to find ronin, masterless samurai to help defend the village. The men find seven: the experienced Kambei, his young disciple Katsushiro, his friend Shichiroji, the strategic Gorobei, good-willed Heihachi, the taciturn master swordsman Kyuzo, and the poser Kikuchiyo. Kikuchiyo follows, despite attempts to drive him away. As the samurai train the farmers and prepare fortifications, Katsushiro meets Shino, the daughter of one of the men sent to find the ronin, and begins a relationship with her. Shortly before the bandits are due to return, two of their scouts are found and killed and a third captured. After questioning, the location of the bandits’ camp is revealed. A pre-emptive strike on the camp sees it burned down, but at the cost of Heihachi’s life. The bandits attack the village and run into the new fortifications and farmers trained to fight back. After a battle inside the village, the bandit chief is defeated, though several of the samurai died in the fighting, and the famers are able to plant a new crop. Seven Samurai was one of the first movies to show the recruiting and gathering of the heroes into a team, a trope that’s commonplace today, appearing in The Guns of Navarone, Marvel’s The Avengers, and the pilot of My Little Pony: Friendship Is Magic. Seven Samurai became Japan’s highest grossing movie after its release. Naturally, it was ripe for being brought across the Pacific Ocean to be remade in Hollywood. 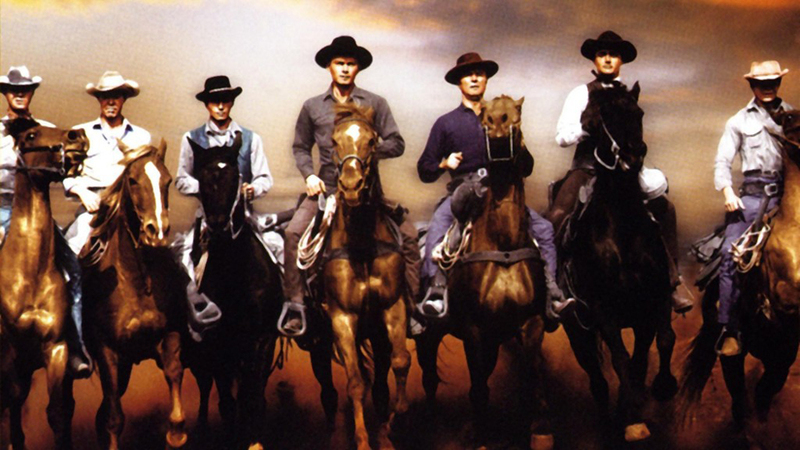 John Sturges took the story and placed it in the Old West with the 1960 film, The Magnificent Seven. The samurai became gunslingers who get hired by a farming village in Mexico to protect it from marauding bandits. The plot of The Magnificent Seven parallels Seven Samurai. The gunslingers, veteran Chris, hotheaded Chico, Chris’s friend Harry, drifter Vin, hard luck Bernardo, cowboy Britt, and outlaw Lee, train the farmers in using guns and defending themselves. Chico falls for Petra, one of the villagers, while Bernardo gets to know three children. The bandits attack and take heavy losses, forcing them to retreat. However, Chico learns that the bandits will return; they have no food and need the village’s supply. The gunslingers move out to surprise the bandits, but are surprised themselves to find the bandit camp empty. Calvera, the bandit leader, returned to the village and, with the gunslingers gone, the villagers put him in charge out of fear. The gunslingers are chased off. After a debate, the group, with the exception of Harry, decide to return to the village to fight Calvera and his bandits. When the gunfight erupts, the villagers join the gunslingers. Harry returns in time to prevent Chris from being shot, but is shot fatally himself. Calvera is shot, the bandits are defeated, and the surviving gunmen go on with their lives. The Magnificent Seven performed well in Europe but not well in the US. The European success allowed for three sequels and several similar films, including the Italian sword-and-sandals film The Seven Magnificent Gladiators (I sette magnific gladiatori) in 1983 and the 1980 space opera, Battle Beyond the Stars. 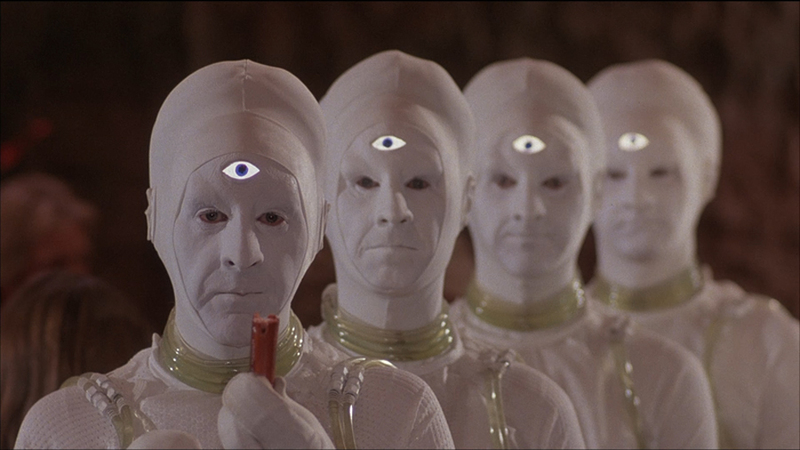 By 1980, science fiction on the silver screen had transformed. Gone were the B-movies with cheap effects like Them. Star Wars and Close Encounters of the Third Kind, both released in 1977, raised audience expectations of special effects, as did 1968’s 2001: A Space Odyssey, 1978’s Battlestar Galactica, 1979’s Star Trek: The Motion Picture and 1980’s Star Wars: The Empire Strikes Back. A green-screened ant made to look the size of an office tower would not do. At the time, CGI wasn’t even a pipe dream; TRON wouldn’t be out until 1982 and The Last Starfighter wasn’t released until 1984. All the effects had to be practical, which could get expensive. Roger Corman, producer of Battle Beyond the Stars, never started a movie that he knew wouldn’t make money. The king of exploitative B-movies, Corman has a reputation of being cheap. While George Lucas was able to make Star Wars with a budget of $11 million, Corman’s was just $2 million, or twice that of Sharknado. With that princely sum, the crew of Battle Beyond the Stars had to make all the sets, costumes, starship interiors, and starship exteriors, and make sure all that met expectations. The art director, Jim Cameron, had a task in front of him. That very same Jim Cameron would go on to create movies such as The Terminator, Titanic, and Avatar. The plot of Battle Beyond the Stars should be familiar by now. Akira, a pacifist planet, is visited by Sador, played by John Saxon. A warlord with an army of mutants called the Malmori, Sador threatens the world into submission with the threat of his flagship’s main gun, the Stellar Converter. The Stellar Converter does exactly what it says on the tin; it converts planets into stars. Sador gives Akira a few days to decide its fate, then leaves, leaving behind a two-man starfighter to watch the world. Realizing that there’s little the inhabitants of Akira can do, the council sends young Shad off to recruit mercenaries and purchase guns to teach the Akirans how to fight. Shad heads off in a former corsair ship, the property of the last warrior of Akira, and the ship’s computer, Nell. Shad’s education is too much to overcome when the Malmori ship fires on him; he cannot shoot back. However, the ship also has speed and can outrun the Malmori fighter. Young Shad’s first stop is at Dr. Hephaestus’ station, where he hopes he can purchase weapons. The station appears deserted when he arrives, though. Shad lands his ship and enters. He is brought to Nanelia, Hepaestus’ daughter and only other living being on the station. She takes Shad to Hepaestus, where the good doctor explains that Shad will be remaining to become Nanelia’s companion and lover. Shad turns down the offer and breaks out of the station. Nanelia, taken with the young man, assists in the breakout and follows a short while later. The two split up, Shad to look for mercenaries and Nanelia to wait in the Lambda Zone for him. While trying to figure out where to go next, Shad is alerted to a long-haul starship being attacked by jackers who are trying to hijack the cargo. The pilot of the ship, Space Cowboy, sends off a distress call. Shad moves in, finding a loophole in his code of conduct, but still cannot bring himself to shoot someone in the back. Despite being on manual, Nell destroys one of the jackers, getting the attention of the other three. With the jackers now facing him, Shad shoots them all down, getting the thanks of Cowboy as he escorts the transport to the next port of call. Sador, however, got there first and uses the Stellar Converter on the world, destroying it. The cargo of weapons, fully paid for, needs to go somewhere, and Akira is much closer than Earth. After a bit of persuasion, Cowboy agrees to help teach the Akirans how to use the guns. Shad heads back out, still looking for mercenaries. He runs into a white, glowing UFO, and is brought on board. The crew of the ship is Nestor, a being and race that has multiple facets but one mind. Nestor is bored and, on hearing of the plight of Akira, agrees to help for no payment at all. The experience would be payment enough. Shad then finds Gelt, an assassin who is so well known in the galaxy that there is no place for him left to live. Gelt has immense wealth, more than anything Akira could offer, but Gelt only has two desires; a meal and a home. After leaving Gelt, Shad is challenged by a small ship, one faster and more maneuverable than his own. After a brief mock battle, the pilot, St-Exmin, a space valkyrie, tags along, hoping to find a battle worthy of her. Meanwhile, in the Lambda Zone, Nanelia is taken prisoner by Cayman, a reptilian being who is intent on selling her to the highest bidder. Nanelia explains why she was there and, hoping that Cayman would be more interested in being paid as a mercenary, mentions Sador. Cayman agrees to join her, the only payment being Sador’s head. Seven ships return to Akira, where plans are drawn and fortifications created to defeat Sador and his mutants. There would be only one chance to destroy Sador and his Stellar Converter; the ship has to drop its force field long enough to let the weapon fire. In that moment, one of the mercenaries could open fire in that precise shot to destroy the weapon and possibly Sador’s flagship. Sador returns, launching starfighters to deal with the ragtag fleet, but the recruited mercenaries are too much for the mutants to handle. On the surface of Akira, Cowboy leads the defense, holding off Sador’s ground troops. After the first wave of fighting, Gelt has been mortally wounded, forced down after a collision with a Malmori fighter. Shad orders his people to bury Gelt with a meal, fulfilling his end of the deal. One of the Nestors allows himself to be captured. Sador’s top interrogator, known for keeping a victim alive through the incredible agony, starts torturing the Nestor. Having no pain resistance, Nestor quickly succumbs to the torture and dies, becoming Dako’s first premature death. Sador orders Nestor’s arm grafted on to him, replacing his damaged one. The remaining Nestors manipulate the arm, trying to slit Sador’s throat. Dako manages to take away the knife and remove the arm. In retaliation, Sador resumes the attack, this time to get in position to use the Stellar Converter. The mercenaries meet him head on, but the force field on the flagship is too much. Ship after ship is destroyed, but St-Exmin manages to fly her tiny ship into the Stellar Converter’s bay, damaging it before going out in a blaze of glory herself. With the Stellar Converter out of action, Sador wants to personally deal with the last of the mercenary ships and its pilot. The last ship, Nell, has Shad and Nanelia on it. A nuclear blast wipes Nell’s memory, resetting it to when the last Akiran warrior was young. When Nell gets caught in a magnetic net to be drawn within Sador’s flagship, Shad uses the net to help accelerate, landing within the vessel while setting Nell to self destruct. Nell, still not all there, has Shad and Nanelia get into a lifepod for launch. The countdown is awkward, but Nell hits zero. The explosion starts a chain reaction through Sador’s ship, destroying it. Akira is saved. 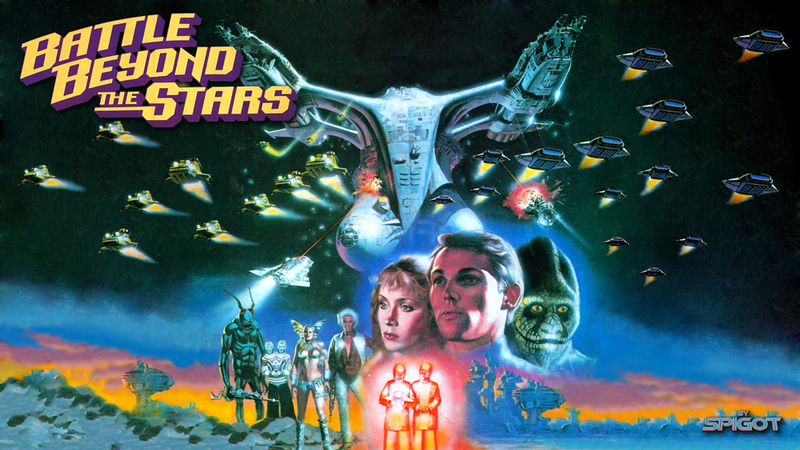 As mentioned, Battle Beyond the Stars was a low budget movie. Despite that, the effects, while showing their age, don’t look as old as they should be. While Corman kept costs down by using interns and film school students, those very same people were able to come up with solutions and sets on the fly, staying up late and overnight as needed. Corman had bought a lumber yard to use as a stage, but kept the old sign up. There were people who came in to purchase lumber who were hired to build sets. Meanwhile, the big-name stars, George Peppard and Robert Vaughn, were placed in memorable scenes but weren’t used throughout the movie, allowing Corman to only pay for the days they were on set. Richard Thomas, being in the midst of wrapping up his role of John-Boy on The Waltons, was looking for a different type of movie from what he had done in the past. He still had money coming in from The Waltons, so could take a cut in pay, allowing him to be in most scenes. Editing pulled together the various shots, especially during the climactic battle, creating a movie that leaves viewers on the edge of their seat, helped by a soundtrack by James Horner. 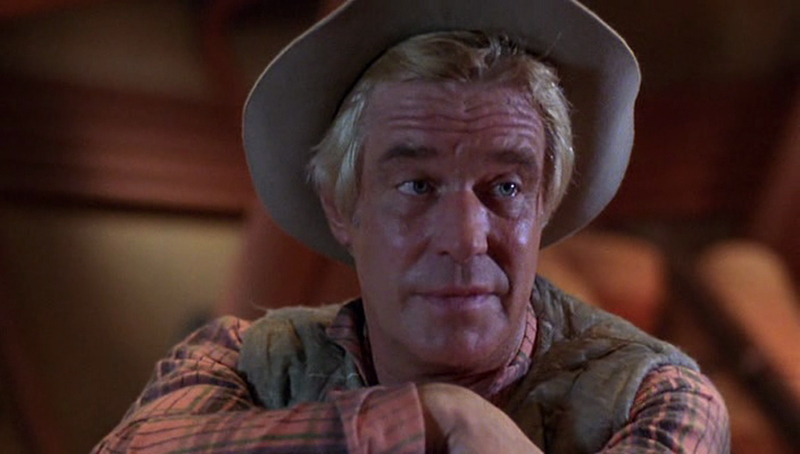 Elements of the music would appear later in 1982’s Star Trek II: The Wrath of Khan*. Battle Beyond the Stars is not a simple remake of The Magnificent Seven or Seven Samurai. Just as The Magnificent Seven brings the samurai drama into the Old West, Battle Beyond the Stars brings both the Western and the samurai drama into space. Yet, the core, the threatened people needing outside help to fend off a villain, remains in each instance. The gathering of the warriors, whether ronin, gunslinger, or mercenary pilot, remains intact. While there are some minor changes, the warriors are recognizable no matter the version. Battle Beyond the Stars‘ Shad, The Magnificent Seven‘s Chico, and Seven Samurai‘s Katsushiro are the same character, just transposed to a new setting. Helping with this is Robert Vaughn’s characters in both The Magnificent Seven and Battle Beyond the Stars; Lee and Gelt are both wanted and too recognizable to appear in public. St-Exmin and Kikuchyo fill the same role. For a B-movie exploiting the popularity of Star Wars, Battle Beyond the Stars took efforts to be recognizable as Seven Samurai as a space opera and succeeded. * While The Wrath of Khan‘s soundtrack is distinct from Battle Beyond the Stars, Horner’s style can be heard in both, particularly in the use of the call of the hunting horns.